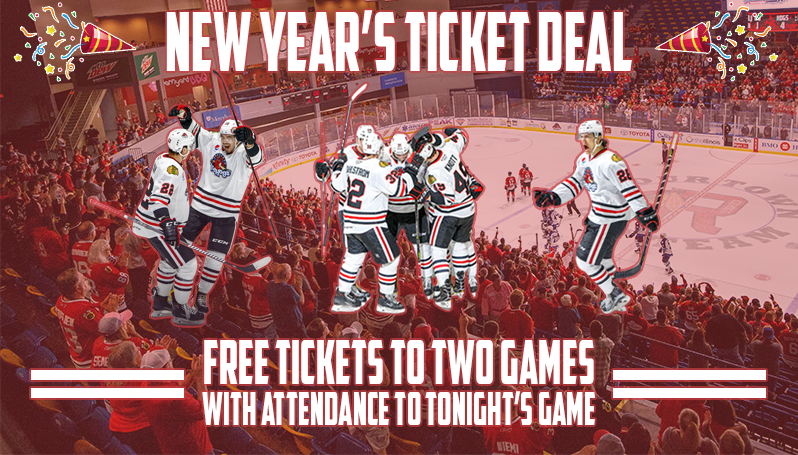 ROCKFORD, Ill. - The Rockford IceHogs are treating fans to a doorbuster special to help ring in the new year. Fans who attended the IceHogs' home game on Wednesday, Jan. 2 vs. the Milwaukee Admirals can redeem their ticket stub from that game at the BMO Harris Bank Center Box Office for a free ticket to both this Sunday's contest (Jan. 6) and Rockford's upcoming Wednesday game on Feb. 6. The IceHogs are also helping fans eliminate the choice of watching either the Chicago Bears' playoff game or the Hogs' home contest this Sunday by showcasing the NFL playoffs in the BMO Harris Bank Center during Rockford's hockey game. Fans can follow all the IceHogs action live at the arena while also watching the Bears' live broadcast on the big screens in either the Blue Flame Lounge or Dental Dimensions Hog Heaven Party Deck. The two free tickets include Sunday, Jan. 6 vs. the Iowa Wild at 4 p.m. and Wednesday, Feb. 6 against the Wilkes-Barre/Scranton Penguins at 7 p.m.
To redeem a ticket stub from Wednesday's game, visit the Box Office or call the IceHogs front office at (815) 968-5222.